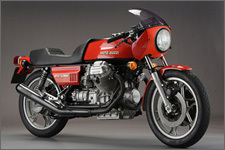 As the successor of the V7 sport bikes, the Moto Guzzi 850 Le Mans gave a new impulse to the Italian Moto Guzzi factory. In the 70s the Le Mans was a spectacular bike which has become a style icon of these years. This website is meant for Moto Guzzi 850 Le Mans enthusiasts, as well as its direct successors and motors that are based on it such as cafe racers. On this non-commercial website you will find a lot of information such as articles published in Dutch, German and English motorsport magazines over the years, as well as technical information. When you have suggestions or material such as magazines, technical information or photographs, you are welcome to submit these via the contact page. 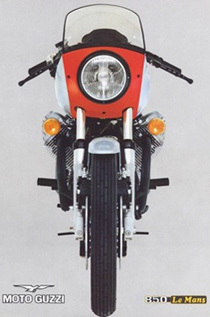 Notifications, appeals, questions, in short, everything you wish to say and which is related to the Moto Guzzi 850 Le Mans can be left in the comment category.